With the wireless Wallmote you control devices and scenes in your smart home easily and intuitively - on the wall and in the hand, completely without a smartphone or tablet. This Wallmote allows even children and the elderly to operate a smart home, without using a smart device. The wireless wall switch is a stationary 4-button wallmote, a portable remote control and a Z-Wave controller in one. It can manage its own Z-Wave network (if configured as a primary controller) and directly control devices such as sockets, blinds, dimmers, lights, electronic door locks and more. Alternatively, it can also be integrated as a secondary controller into an existing Z-Wave network for use in wireless control of devices and scenes. The battery-powered device has a magnet and can thus be stored in the corresponding wall bracket. This makes the Wallmote act as a real wall switch. But you can also just take it out again and use it as a portable remote control. The respective mode is activated after the first action in the delivery state. 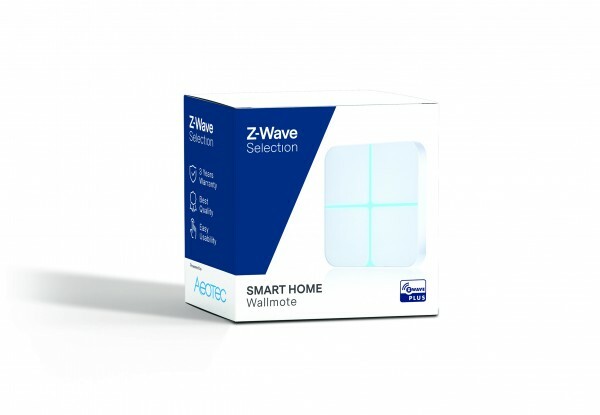 As a secondary controller, the wireless Wallmote sends commands to the Z-Wave control panel and controls defined devices and scenes. As a primary controller, it sends its commands directly to the connected devices. The Wallmote responds to a single click and masters the so-called "sliding" to trigger corresponding functions. With this special touch control, you wipe your finger over the corresponding area on the wireless wall switch and can dim the light intuitively. Smarthome also works without a smartphone: With this wireless Wallmote, you can control devices in your smart home intuitively by hand using a touchpad.